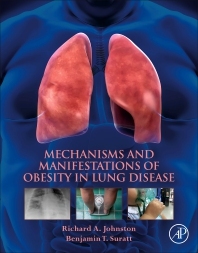 Mechanisms and Manifestations of Obesity in Lung Disease is a complete resource on the epidemiology and molecular mechanisms related to obesity and lung disease. Obesity has not simply changed the epidemiology of pulmonary disease, it has had a profound impact on the pathophysiology of common pulmonary diseases. As the obesity epidemic has taken hold throughout the developed world, scientists and clinicians are now challenged with identifying the mechanisms by which obesity alters lung health and the pathogenesis of lung diseases. This book is an important new resource for both clinicians and scientists dealing with these new health problems in pulmonary medicine. 6. Obesity and Asthma: What Have We Learned from Animal Models? 12. Obesity and the Microbiome: Big Changes on a Small Scale? Richard A. Johnston, Ph.D. is currently a Research Pharmacologist at the Centers for Disease Control and Prevention and an Adjunct Associate Professor at West Virginia University. Dr. Johnston was bestowed with the degree of Doctor of Philosophy in Pharmacology and Toxicology from West Virginia University and subsequently completed a post-doctoral fellowship in the area of lung biology and respiratory disease at the Harvard School of Public Health. Before arriving at the Centers for Disease Control and Prevention, Dr. Johnston was an Assistant Professor at The University of Texas Medical Branch at Galveston and The University of Texas Health Science Center at Houston. Dr. Johnston is a member of the American Society for Pharmacology and Experimental Therapeutics, the American Physiological Society, and the American Thoracic Society. As an active member of the American Thoracic Society and for his contributions to the field of pulmonary medicine, Dr. Johnston was recently designated as an American Thoracic Society Fellow. Dr. Johnston has been a member of National Institutes of Health Study Sections and has been a peer reviewer for over fifteen scientific journals. Dr. Johnston’s research career has focused on understanding the impact of obesity and adipocytokines on lung injury, lung inflammation, and airway hyperresponsiveness in response to air pollution and occupational sensitizers. Dr. Suratt is a Professor of Medicine and Cell & Molecular Biology; Vice Chair of Medicine for Academic Affairs; and the Associate Chief of Pulmonary Disease and Critical Care Medicine in the Department of Medicine at the University of Vermont College of Medicine. He is an active member of over 10 professional organizations including the American Thoracic Society, the Society of Critical Care Medicine, and the American College of Chest Physicians. Dr. Suratt's research career has focused on the role of innate immunity in the pathogenesis of critical illness, particularly ARDS. His recent work has focused on host factors, such as obesity and elements of the metabolic syndrome, and their influence on inflammatory response in the development of and outcomes from critical illness.